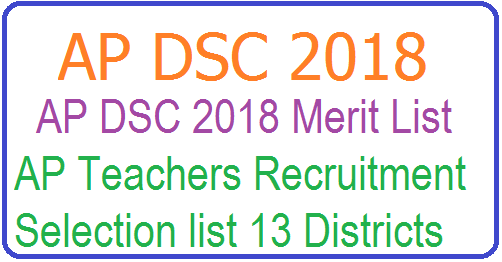 AP DSC SGT Merit List 2018-19 - SGT DSC District wise Rank Card at apdsc.apcfss.in. AP DSC 2018 announced SGT Merit List and LP Merit list at website of CSE Generation of Selection list, Conformation of Selection list District Selection Committee Verification and Uploading of Certificates of selected Candidates at District Ananthapur Chittoor East Godavari Guntur Krishna Kurnool Nellore Prakasam Srikakulam Visakhapatnam Vijayanagaram West Godavari YSR Kadapa Level through Online Submission of ineligible Candidates List to CGG Regeneration of Selection List Submission of vacancy list by DEOs Verification of Certificates of Revised selected Candidates List Display of Final Selection List Web counseling , Generation of Posting Orders. AP DSC SGT Merit List 2018-19 - SGT DSC District wise Rank Card at apdsc.apcfss.in. AP DSC 2018 Merit List-Selected List 2018 SAs, SGTs, LPTs, PETs Merit List.